http://tinyurl.com/ofucwmq Antique wooden Lace bobbin winder. Base 40cm, wheel 20 cm dia. 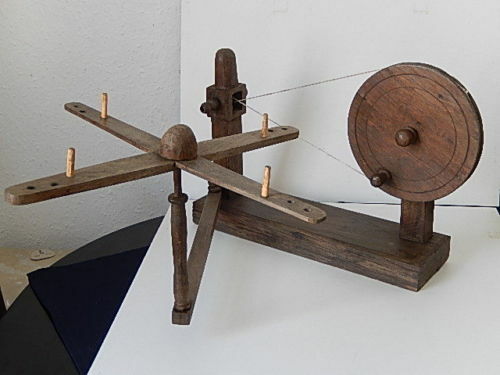 Comments: An English windmill bobbin winder with a solid wood base. Sometimes the base has a drawer, but not here. Usually the English winders have a cup-like holder for the bobbin which seems to be missing in on this piece. Seller also notes that the windmill doesn’t fit well on the arm peg, but that could be adjusted. Modifications: Looks like the bobbin holder is missing. Damage: A few cracks in the base, some expected signs of wear. Comments: A narrow border of Mechlin, early 19th c style.Straight lower edge, simple flowers with small leaf sprigs used as esprits. 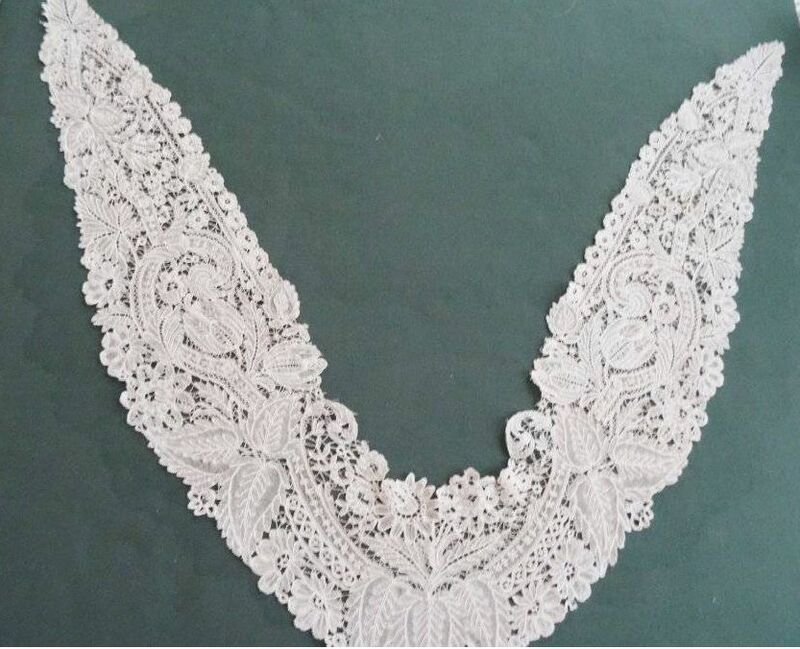 Typical lace meant to be ruffled. Modifications: Cut and secured both ends, engrelure added. Damage: A few pulls and minor pinholes in the mesh. Finish: No obvious wrinkles or creases. Comments: A border of Mechlin, probably 2nd half of the 19th century, perhaps 20th. Elaborate romantic floral design, very precisely made. An impressive piece. Soilage: Cream color, one stain at bottom 5″ from one end. Finish: No obvious wrinkles or creases. Looks unused. Size: 58 cm long at back, 43 cm long at front. 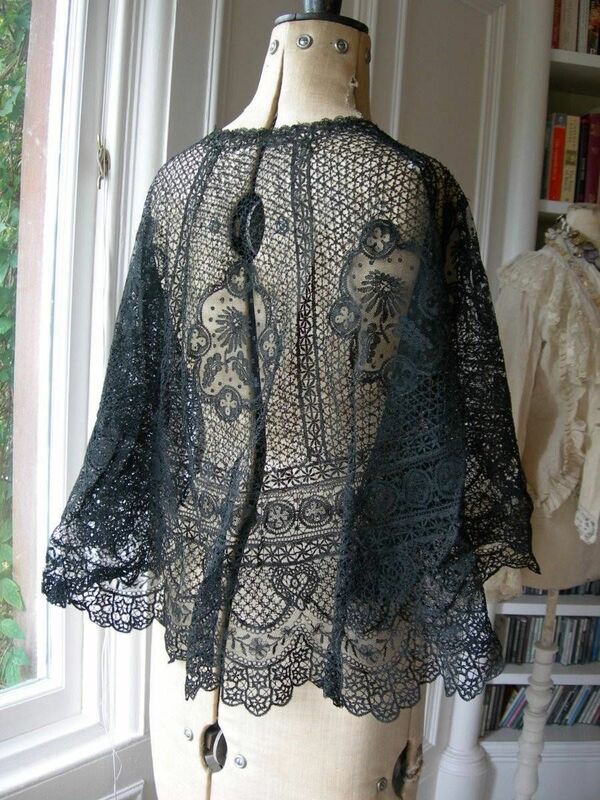 Comments: A short cape or ‘pelerine’ of black silk Le Puy guipure. For a fairly traditional design, I think this is an impressive piece. Note the elaborate double plaited picoted cross ground, along with other ground variations. 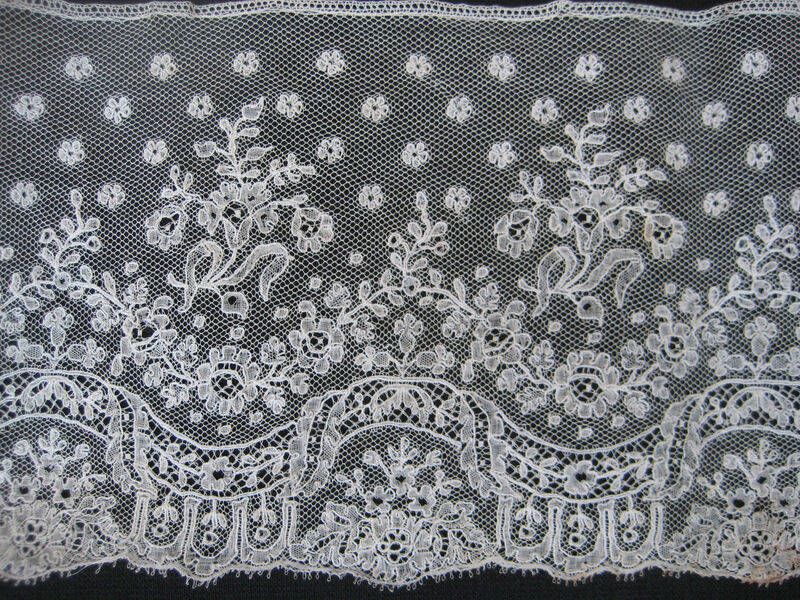 Typical motifs on half-stitch ground are impressively worked. Just wish there was a photo of the whole thing laid flat. Comments: A long collar of Duchesse de Bruges. This is a high-end market piece with some innovative motifs (tulips? ), all done in excellent technique. Note the unusual back neckline, no sign of an engrelure. But I believe it is original. Good raised work on half-stitch ground in the strapwork, and the leafwork is impressive. Finish: Vertical fold crease along centerline. Sold for 166.00 GBP, 6 bidders. Comments: A Beds handkerchief “famous Rose and Leaf design”, illustrated in Bucks Cottage Worker’s Agency catalogs (Harry Armstrong). The pattern comes up for sale occasionally, I have several examples in my collection. 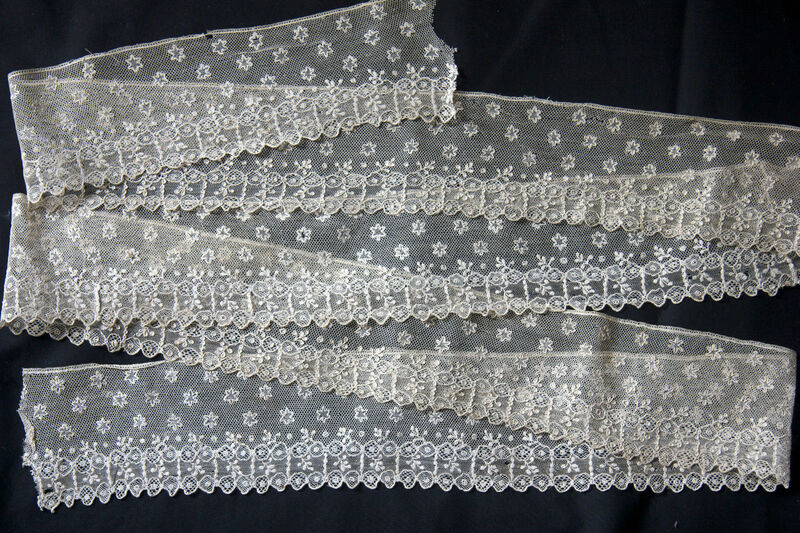 All are slightly different depending on how the lacemaker chooses to work the raised tallies in the motifs. Soilage: Pale ivory color, small brown mark on the center cloth. Finish: Horizontal and vertical fold creases. Slight wrinkling at the edges, minor. Sold for 43.00 GBP, 7 bidders. Size: 13.7″ square on both. Comments: Two handkerchiefs of Ñanduti, although the second one does not have the typical palm leaf motifs. And I think the center of the second one might be a later addition. Both have typical large sol motifs, 5 different ones n the first, 2 in the second. Smaller motifs are used for joining, with a complex ground in the first one. Both are good example, although the first is more typical of Ñanduti. Modifications: Unsure about the centers of both, the cloth is not well joined in the first piece, and the center is just a bit odd in the second. I don’t know if that was part of the original piece. Soilage: Pale ivory color on both, with some small pale brown brown marks. Sold for 26.00 GBP, 4 bidders. Sold for 49.00 GBP, 4 bidders. Comments: A border of late 18th c Herren Alençon. Réseau fin along the edge, I can’t tell if it’s brides tortillée or brides bouclé above. I’m guessing buttonholed, but the photos aren’t close enough to tell. Small trefoil leaves used as esprits, and the lower border has circles with two types of fillings. Minimal decorative ‘mode’ fillings. Modifications: One join. Cut both ends, engrelure added. Damage: A few ;minor pulls in the ground, some small holes along the lower border, minor. Occasional small hole close to the engrelure. Soilage: Some localized brown spotting. Sold for 143.00 EUR, 4 bidders. Size: skirt – 33″ waist, 99″ around bottom, 39″ long. jacket – 16″ shoulder to hem, 17″ wide underarms, 12″ long sleeves. Comments: A jacket and skirt of probably Italian origin. Milanese in style, but probably an early 20thc piece. Some kind of Eastern European origin is not out of the question. Interesting ‘flower pot’ motif in the skirt panels, and note the filling stitches, and occasional decoration of the tape with holes. I’m not particularly bothered by the lack of fitting, I think the piece is designed to fit loosely, and would be worn over some colored under-dress. This is a very interesting set. Finish: A few fold creases. Sold for 355.00 GBP, 6 bidders. 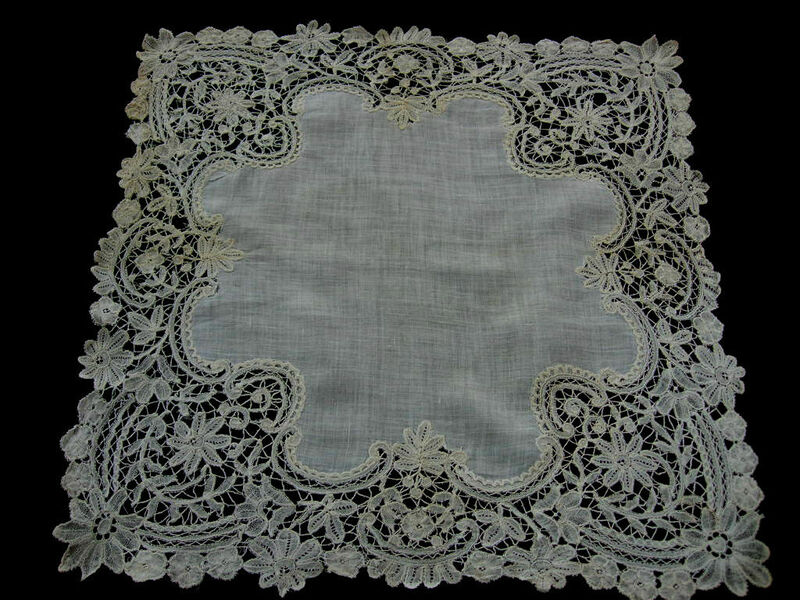 http://tinyurl.com/qxqu735 Fragment antique/vintage linen Reticella lace border poss. 17th c.
Comments: An insertion and scalloped edge border of Genoese bobbinlace. It looks like an early 17th c piece, especially with the compact woven leaves. 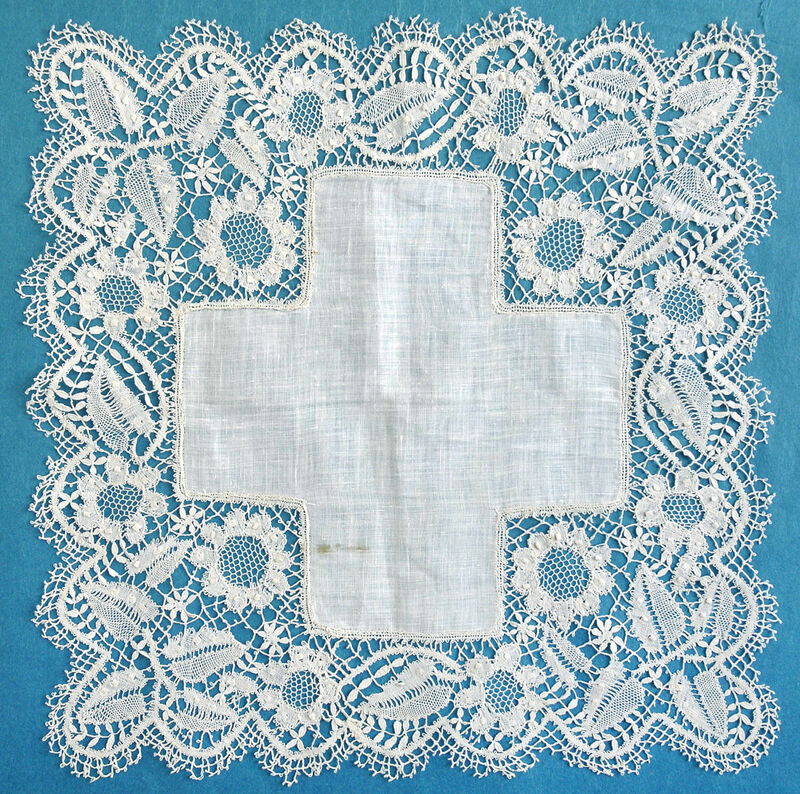 The top insertion is based on reticella design, while the bottom is another typical Genoese motif with a ‘fan-like’ border. You do have to be extremely careful on age attributions with a piece like this, but the photos look good. 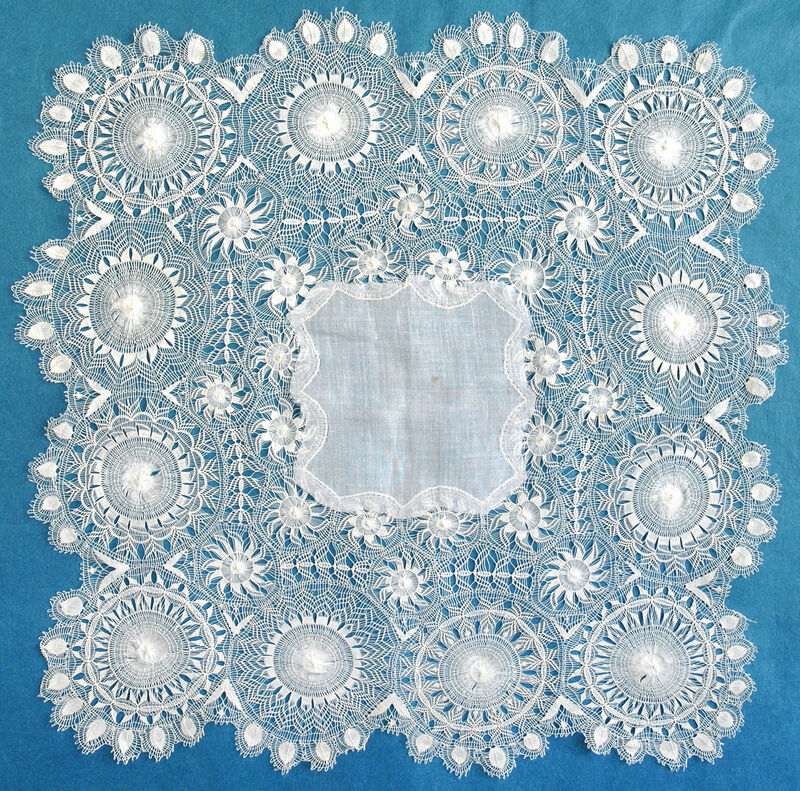 Especially the double plaited line running vertically which divides the motifs – you see similar things in contemporary Punto in Aria needlelace. Damage: Some loose threads along the top. Seller cites several broken brides. Soilage: Seller cites mid ivory color with pale brown age marks. Sold for 37.00 GBP, 3 bidders. Comments: A fairly deep border of Duchesse (cotton). 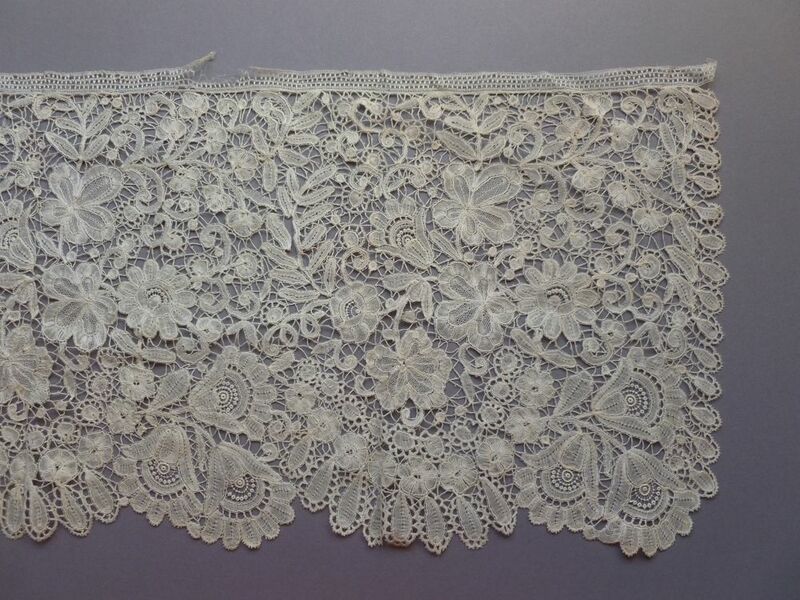 Note the termination both sides -unusual to see a formal completion on this kind of lace. I’m not sure if it is original. 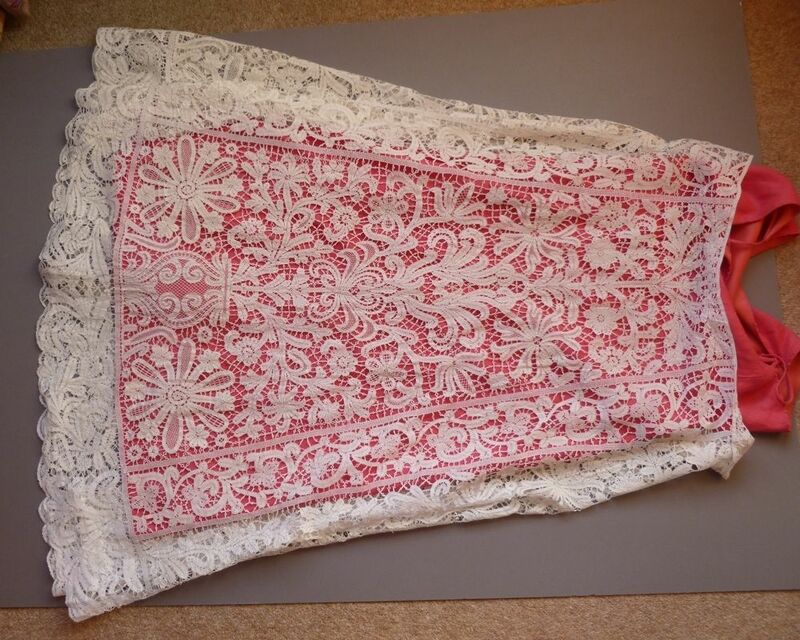 Seller thinks the lace might have been used as a veil, although the design is a little dense for such an application. Motifs are well designed in a dense floral pattern. Note the decorative ‘mode’ fillings in flower centers – although no formal Point de Gaze inserts which would push this toward the Brussels Duchesse style. Modifications: Both ends finished – not certain if this is original. Damage: One break in the engrelure, lace looks intact. Sold for 185.00 GBP, 6 bidders. 3.5″ deep lace, 3/8″ engrelure, x 1.2 meters. Comments: Two sections of the same Point de Gaze border, with double raised petal roses of naturalistic form. Raised rings in flower centers, and decorative ‘mode’ fillings in the strapwork, all of the same type. Note the unusual triangular fillings just above the strapwork. Provenance: Came with a note stating the two pieces together cost 20.00 GBP, seller thinks in the 1920’s. Modifications: Both cut on both ends, although the cuts look along original join lines. Engrelure added. Soilage: Isolated brown spot on the 2nd piece. Finish: A some light fold creases. Sold for 195.00 GBP, 11 bidders. Sold for 87.00 GBP, 11 bidders. 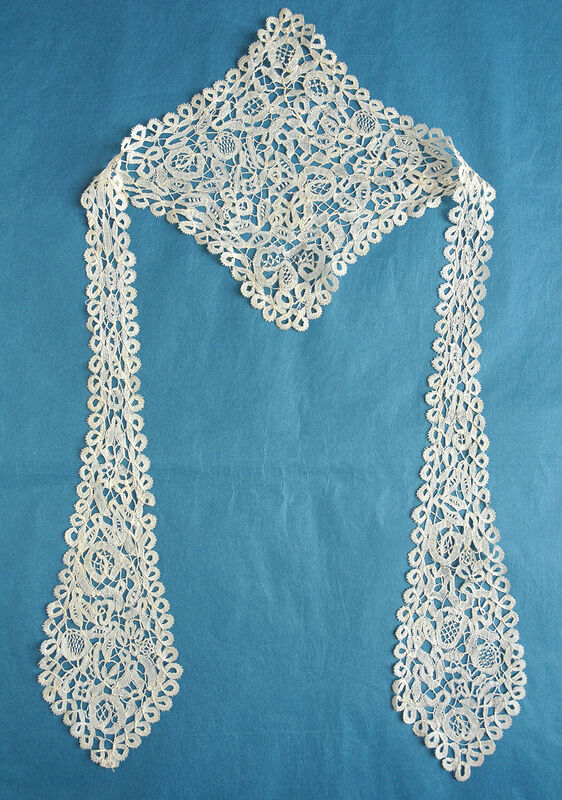 Comments: A Chantilly lappet scarf. Simple design, well executed. Damage: Some pinholes in the mesh around the back. Comments: A collar and two cuffs of Carrickmacross applique. A little guipure work in the collar along the outer edge with picoted bride fillings, some meeting in raised circles. Interesting rectangular bar fillings further up. Also includes ring esprits and some good needlerun fillings. The cuffs share a 5-petal flower with raised center with the collar, but the match between the two is a little off. I’m wondering if these might also be some kind of pieced collar rather than cuffs. Modifications: None. Tape sewn to the tops of the ‘cuffs’. Damage: Some pinholes in the tulle. Soilage: Ivory color, two small age discoloration marks. Finish: Soft fold creases in the collar. Sold for $32.00, 3 bidders. 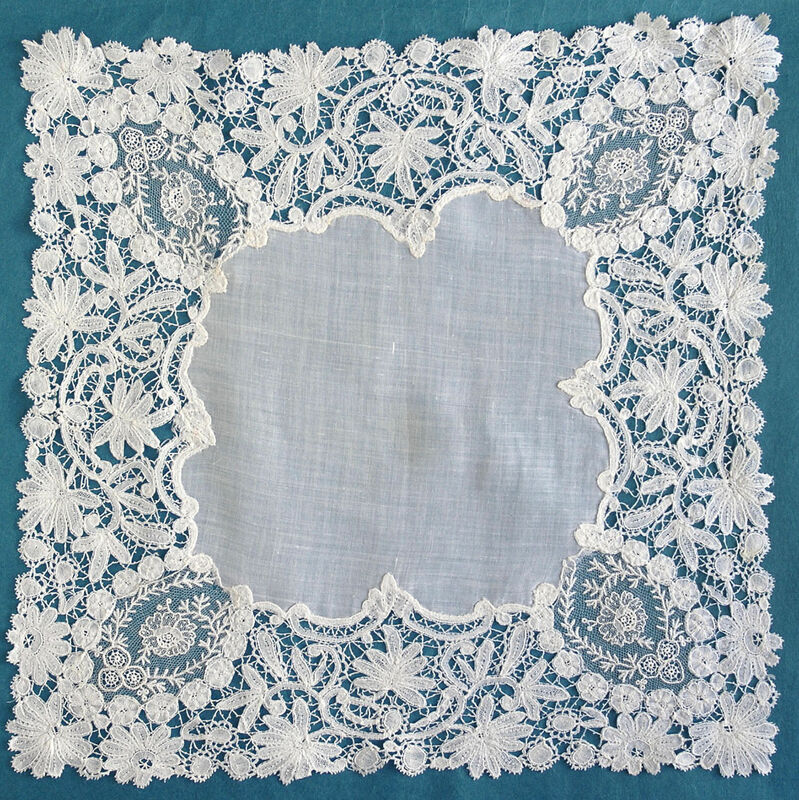 http://tinyurl.com/nuo7dxx Antique Handkerchief / Hankie Needle Lace on Net Square Bordr Lace Trim LOVELY! 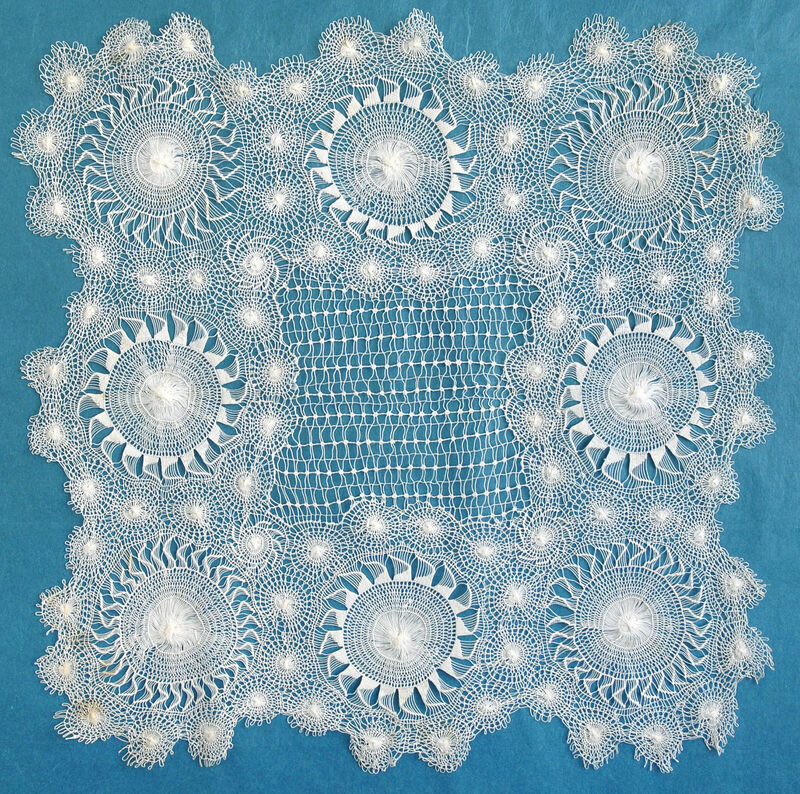 Comments: A handkerchief of Brussels needlelace applique on machine net. Good romantic floral design, with an edge of bell-like flowers in series. It’s not very common to see needlelace applique in smaller pieces like this. Damage: Small holes and pinholes in the tulle. Some fraying along inside and outside edges. Soilage: Ivory color. Seller notes stains and light yellowing. Finish: Seller notes it feel stiff as though starched. 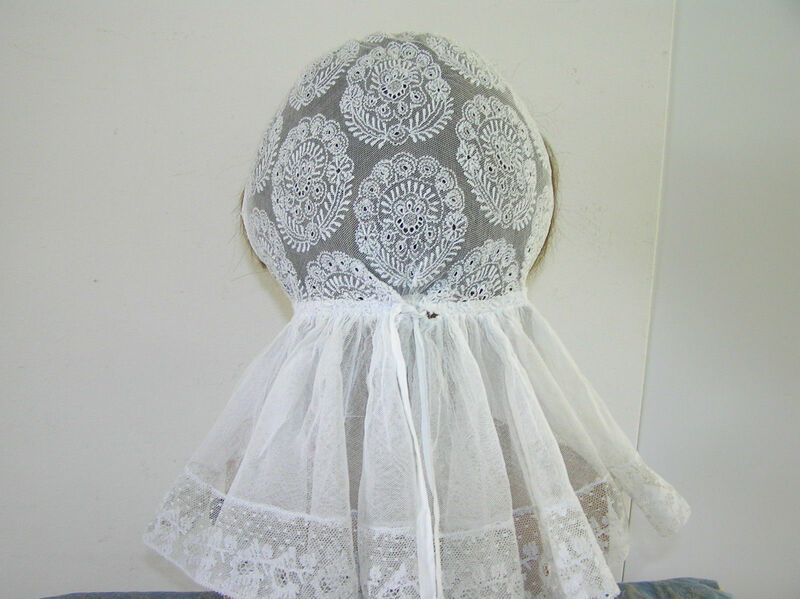 http://tinyurl.com/n9p9les ANTIQUE EDWARDIAN HAND MADE WHITE LACE WOMAN’S CAP. Size: 14″ long, 11″ wide (not sure how those measurements were taken). Comments: I think this is a Dutch cap – note the Beveren lace along the lower border. 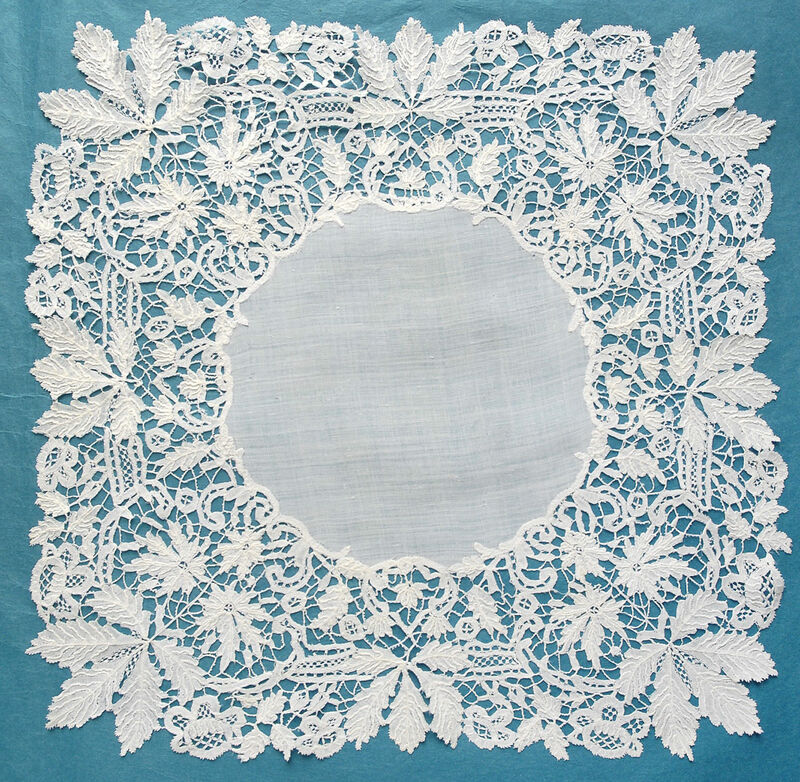 The cap itself is embroidered net in a similar style as the lace; and the piece has been cut to fir the head. That’s not an unusual arrangement for caps like this. The cap back is rather small, so there are ties under the chin. 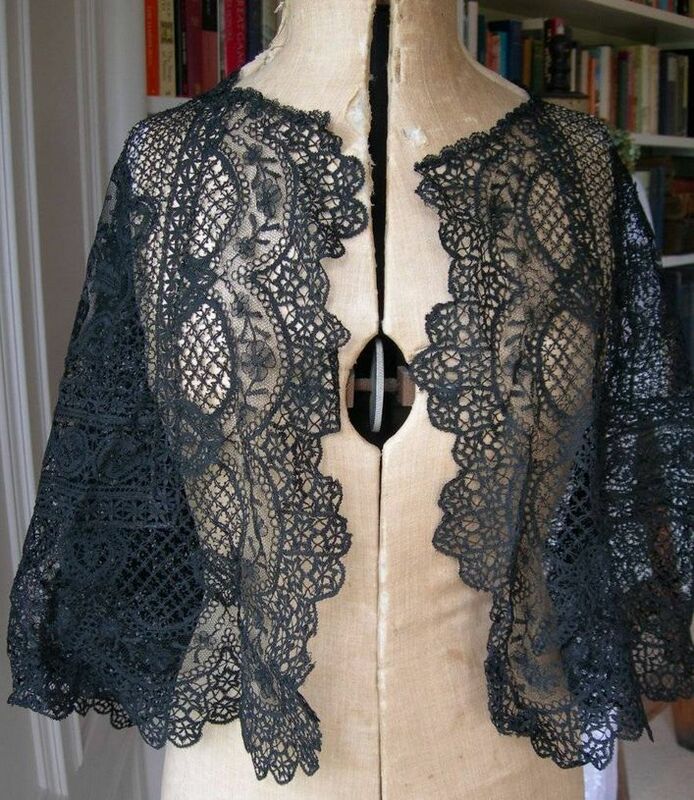 Quite an elegant design, and a good example of how Flemish lace makes its way to the Netherlands. Damage: Small separation between the fringe and cap back – minor. Finish: Expected creases in the fringe. Unsold as of 7/19/2015 3:28 PM MDT. Comments: Matching cuffs (or scarf ends as the seller notes) of Irish Crochet. Tight dense work with raised rings used in motif centers. Typical 3 or 4 lobed pinwheel arrangements. Picots look like crochets loops. Comments: A handkerchief, and I wonder if this is Honiton given the extensive woven tally leadwork fillings. Closely woven work, irregular picoted brides, lots of raised veining in the leaves. Interesting, delicate design. Modifications: None, although the center cloth looks like a replacement. Damage: Some broken brides, pinholes in the center cloth. Soilage: ‘Soft old white color’, seller says it has been laundered but doesn’t give any details on the process. Sold for 134.00 GBP, 4 bidders. 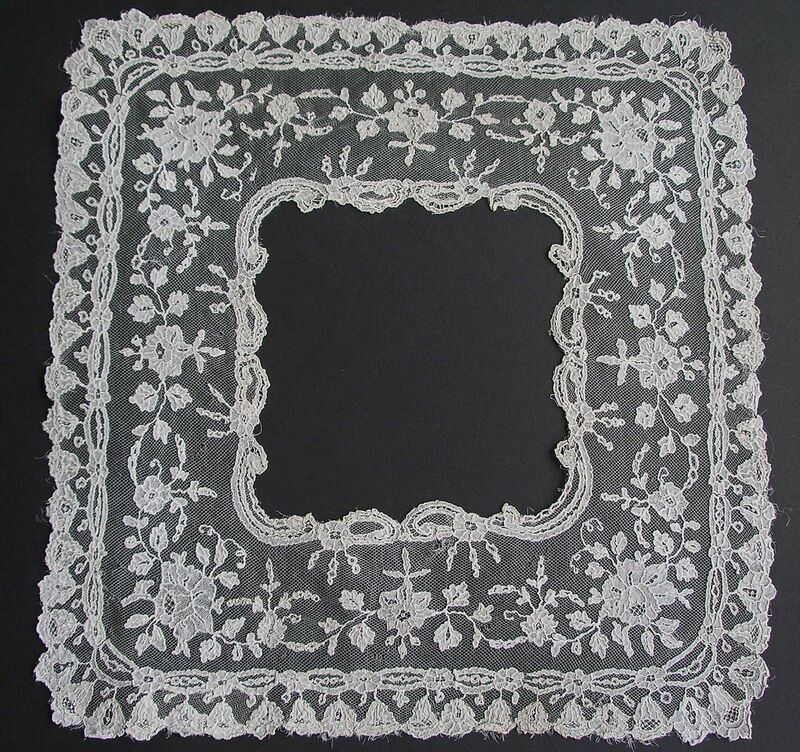 Comments: A Honiton handkerchief with bird and butterfly figures, monogram AHH worked in lace in one corner. Well made motifs breaking out of the snails/slugs mode, and note the unusual ground added to the piece. There is some interesting raised work in some of the leaves, as well as precise woven leadwork tallies, sometimes used as part of the rose spirals. An unusual and very effective piece. Damage: Some tiny holes and pulls in the center cloth. Lace looks good. Soilage: Mid ivory color. 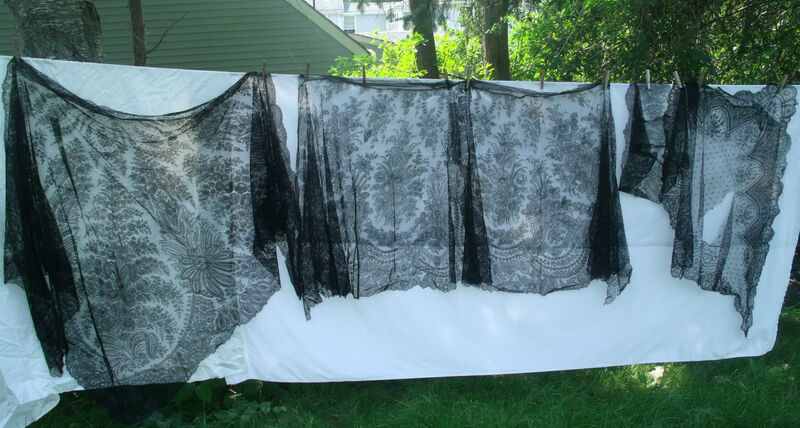 Seller says it has been laundered but gives no details on the process. Center cloth has some brown age marks. Finish: Faint horizontal and vertical fold creases. Sold for 67.50 GBP, 5 bidders. Size: 5.9″/6.2″, not sure what that means. Perhaps a width variation? Comments: A Point de Gaze collar, no raised work. Good decorative mode fillings, with a naturalistic effective design. I especially like the extensive grids of fillings near the ends. Excellent technique, a higher end market piece. Damage: Scattered pinholes in the mesh. Soilage: Some light brown areas. Sold for 120.00 EUR, 1 bidder. Comments: A Duchesse de Bruges handkerchief. Romantic floral design – the motifs are a little loosely worked, but this helps give the dense pattern some lightness. Damage: A few frayed ends in the motifs. 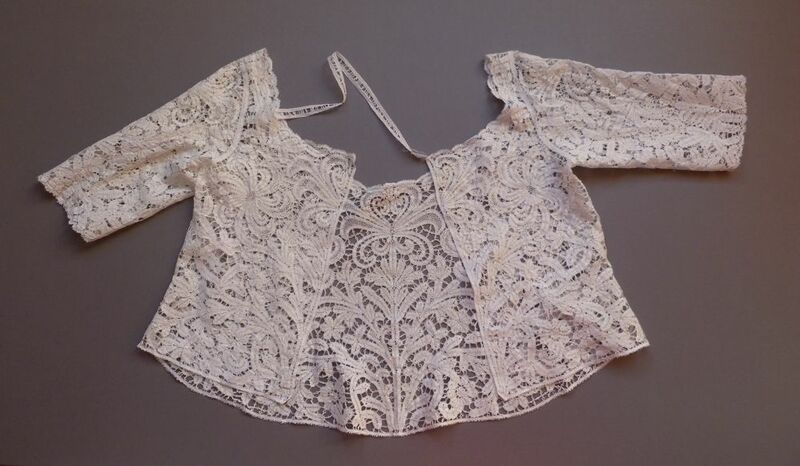 Finish: Lace looks worn – probably laundered and pressed at some point. Size: 9.5″ long, 17″ wide. 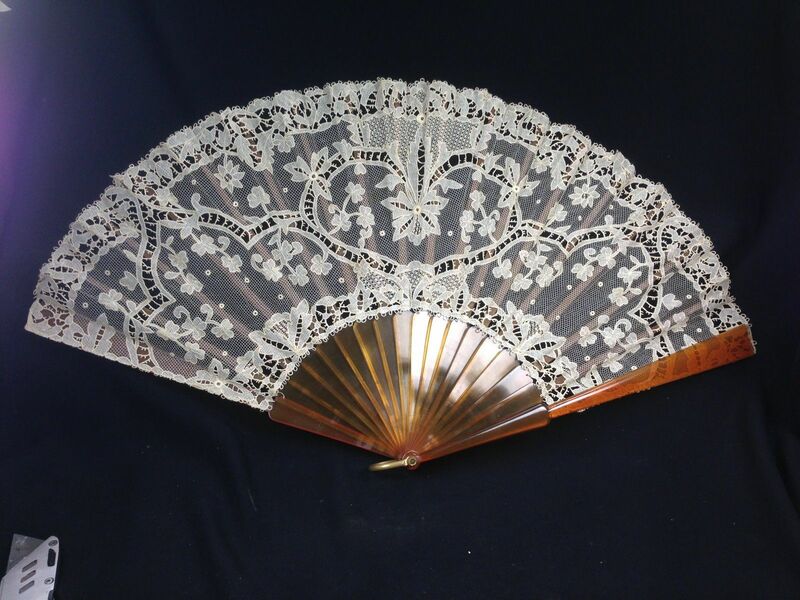 Comments: A Carrickmacross applique fan with blonde sticks. The design includes some cutwork guipure with double picoted brides. Large areas of needle-run fillings. 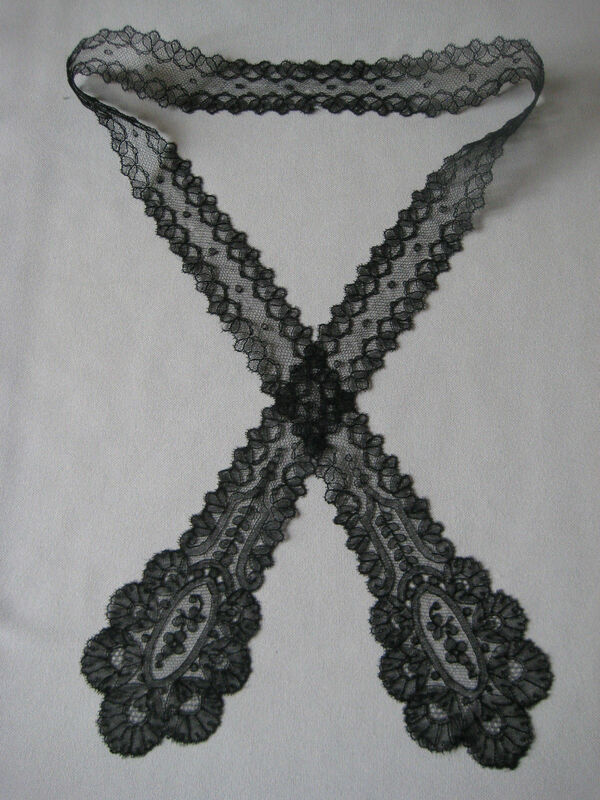 There is no guard extension on the lace and the design looks a bit cut off at the ends. But it all appears to be one piece, and all sides have the typical looped picots. Lots of shamrocks in the design, and the technique is excellent. Comments: Three large pieces of Chantilly. 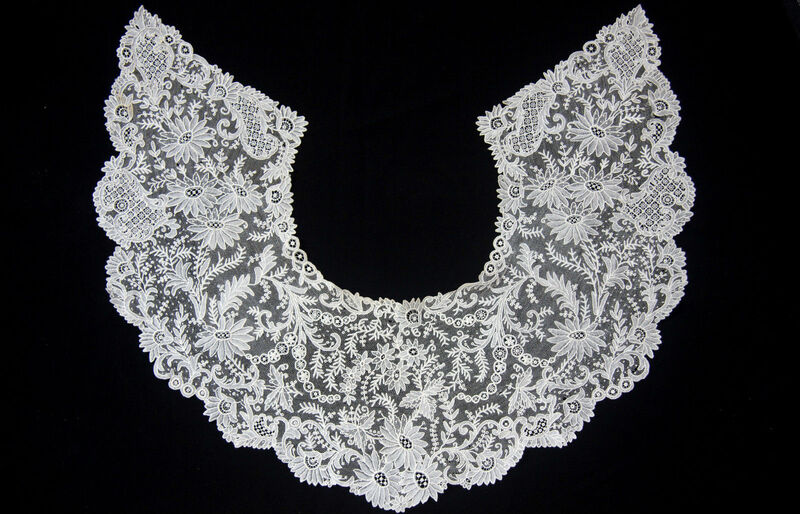 One triangular shawl, one diamond-shaped mantilla, one wide flounce probably a skirt piece. You can get a good looks at the shawl in one photo, the rest are a little hard to see. The large ‘trees’ in the triangular shawl almost look Indian in origin. All are basic 2nd Empire romantic floral design. Note the figural flower baskets in the mantilla. Many racroc splits – these are difficult to repair properly, mainly because of lack of access to the proper thread. Quite an interesting set of laces. Modifications: None for the shawl and mantilla. Can’t see the ends of the flounce to tell if they are cut. Damage: Racroc splits in the shawl, serious racroc? 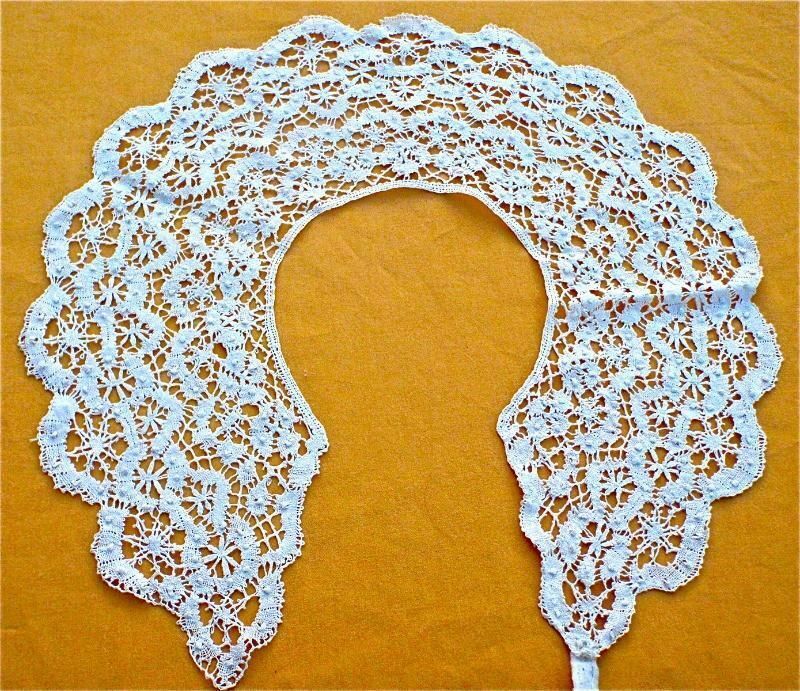 tear in the mantilla. Looks like some repair has already been attempted. Small holes and pinholes elsewhere. Sold for $239.50, 9 bidders. 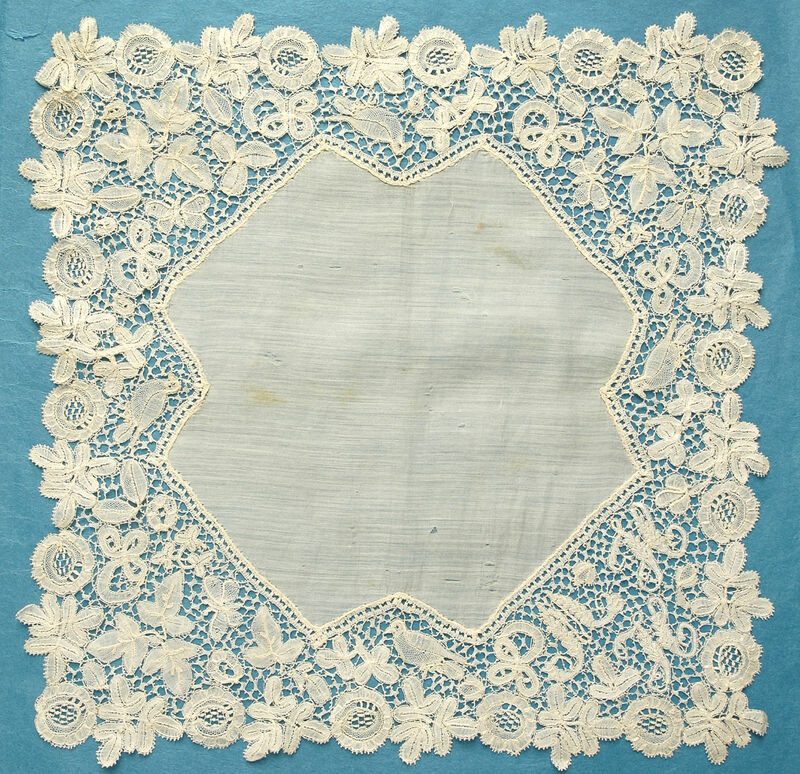 Comments: A handkerchief of Duchesse de Bruxelles, no raised work in the point de Gaze motifs. 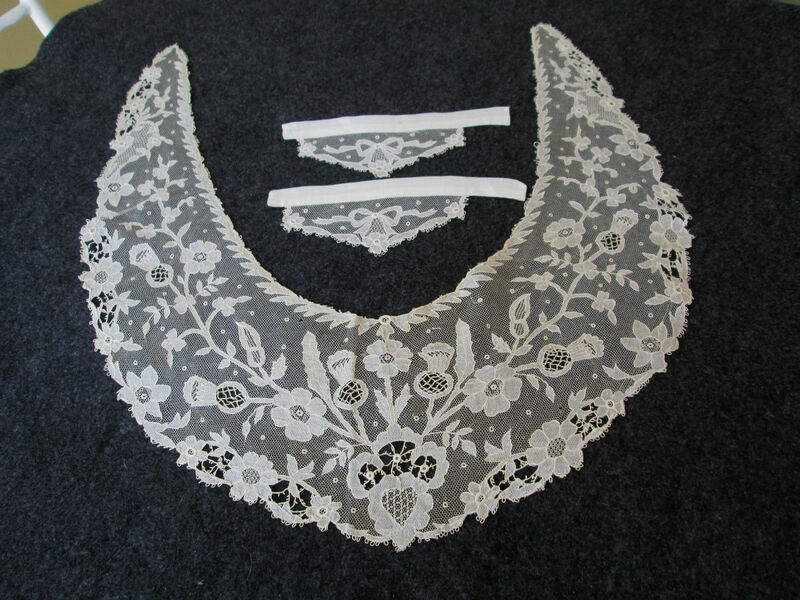 There are three decorative ‘mode’ fillings in each needlelace insert. Conventional Duchesse bobbinlace in a dense pattern, no raised work (piece is photographed from the back, so not sure if there’s raised work on the front side). 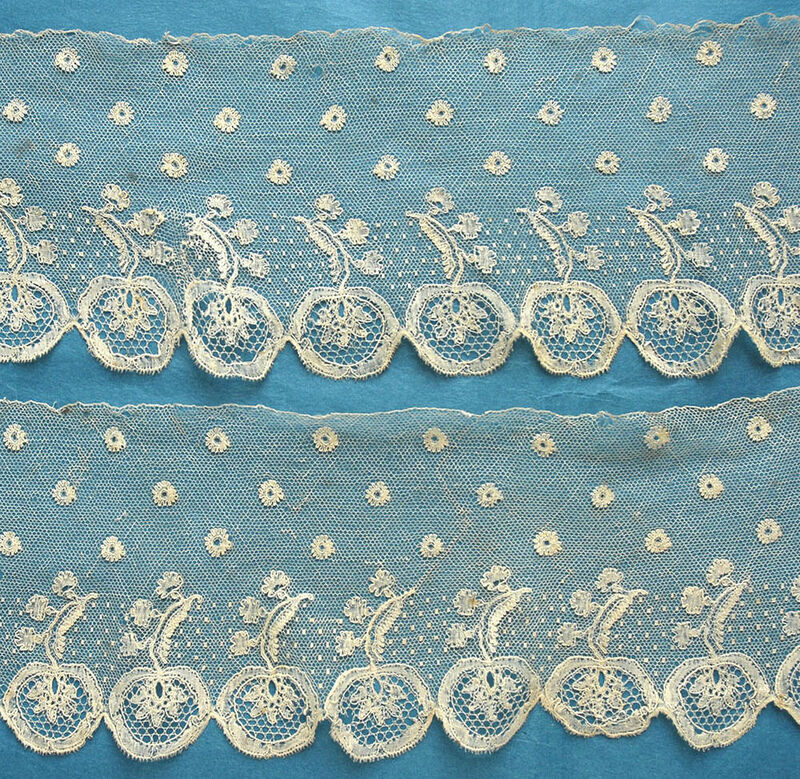 Center cloth is a replacement, and the attachment is odd causing the flowers around the needlelace inserts to be off, and the entire center thrown asymmetric. 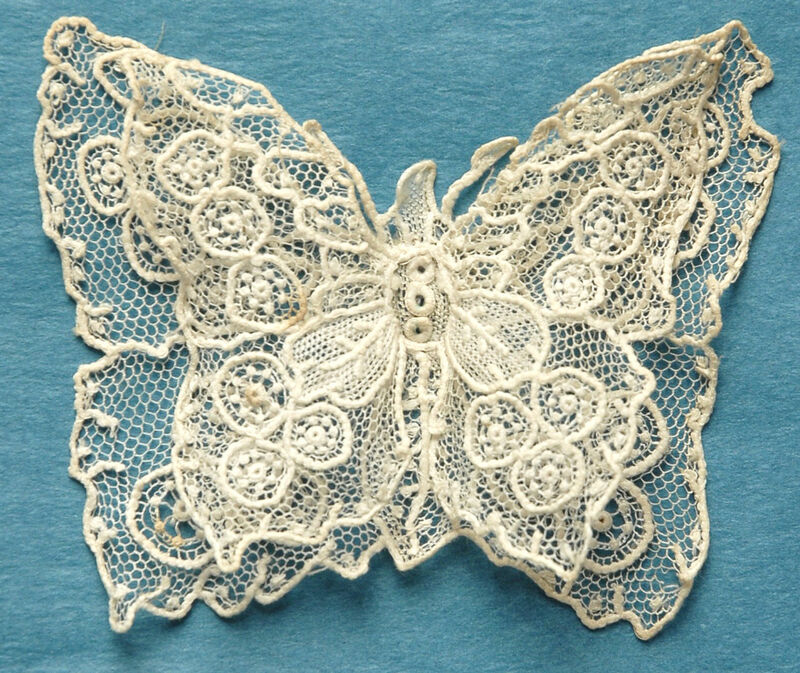 Modifications: Center is a replacement, sewn to the wrong side of the lace. Damage: A few missing brides. 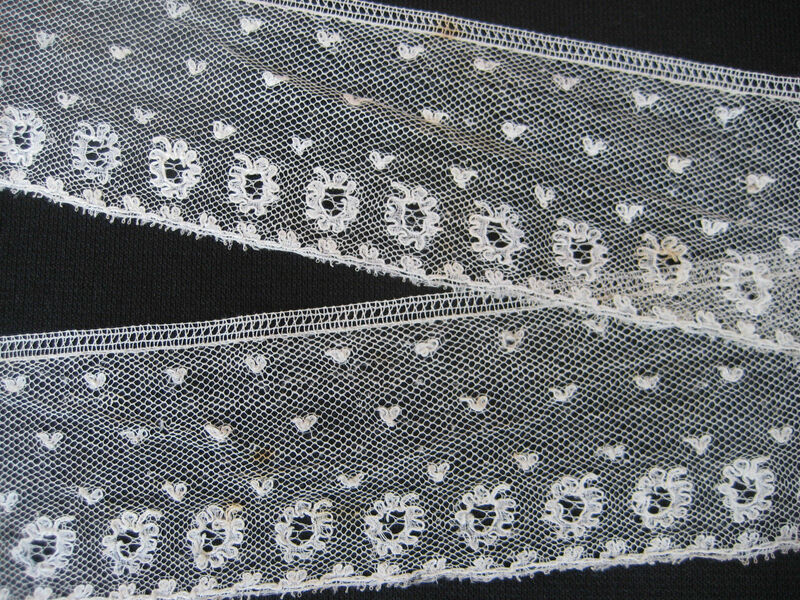 Some small holes in two of the needlelace motifs along the edge. Soilage: Seller notes a previous wash, bright white color, which could indicate bleaching. Sold for 55.00 GBP, 7 bidders. Comments: A Point de Gaze butterfly. 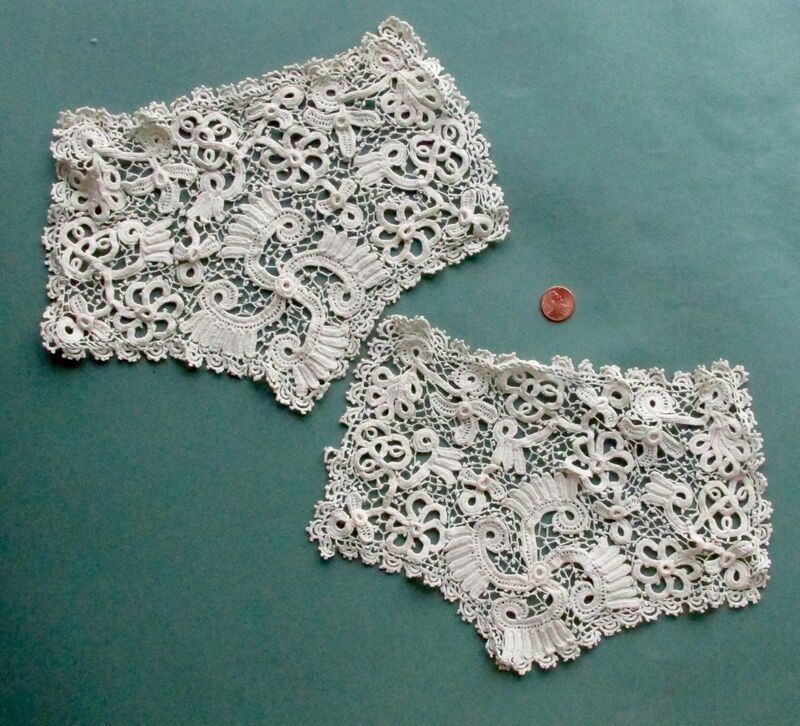 These were made in the first part of the 20th century as tourist items – I met a lacemaker who was still making them in 1980. They vary a lot in quality. This one has more than the usual amount of Point de Gaze mesh in the lower wings, and quite a few decorative ‘mode’ fillings. Three raised rings form the body. Soilage: Mid ivory color with a small brown age mark. Finish: A little wrinkled. The antennae aren’t quite crisp, minor. Sold for 83.00 GBP, 3 bidders. Size: 15″ x 15″ laid flat. 5″ depth, neck opening 6″ across. Comments: A Cluny collar, which implies French manufacture. 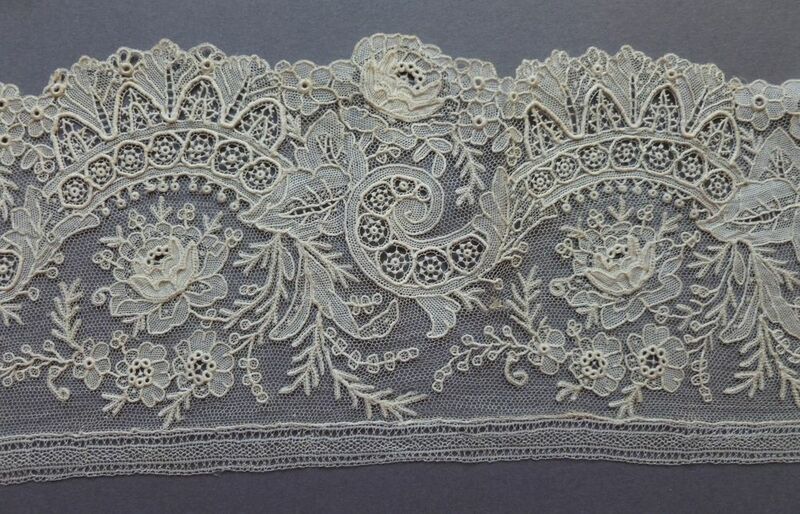 But note, English workers established a lace industry in India, and Beds-type lace resembling this was made there also. Difficult to say, but the thread might be linen. Raised tally work on the trails – nicely executed. Provenance: Piece has been in the seller’s family for over 90 years. Finish: Some light fold creases. Comments: A border of Lille point ground lace. The ground is a bit uneven, usually an indication of thread quality, and I think it might be linen. Heavy border with woven esprits, small buds used as esprits above. Probably early 19th c.
Damage: Numerous small holes and pinholes. Soilage: Localized brown staining throughout. Ecru color overall. Sold for 32.00 GBP, 2 bidders. Comments: A Honiton fallcap, snails/slug styles with a lovely form. Woven tally leadwork fillings. Not the most precise work, but the overall effect is excellent. Damage: Seller cites occasional broken bride. Soilage: Mid ivory color with localized age discoloration. Sold for 23.25 GBP, 4 bidders.